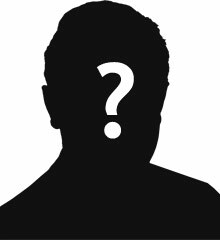 James was the son of Michael and Catherine Donnelly (nee Mooney). James was born James Donnelly was born on 22 November 1894 in County Tyrone. For a few years the family ran a public house and grocery shop in Drumullan (known today as the Sit & Sip) but by 1911 they had returned to the family farm in Drumaney. In 1914, he sailed from Derry on 14 April 1914, bound for Newark, New Jersey. 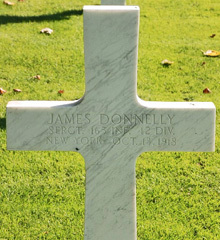 When the United States entered the war in April 1917, James Donnelly was eligible for conscription, and when the 42nd (Rainbow) Division was activated in August 1917, he was drafted to Company B of the 165th Infantry Regiment (better known as the 69th New York. Sergeant James Donnelly was killed in action a week shy of his 24th birthday on 15th Octboer 1918. He is buried Meuse-Argonne American Cemetery in France. Within the Meuse-Argonne American Cemetery and Memorial in France, which covers 130.5 acres, rest the largest number of US military dead in Europe, a total of 14,246. Most of those buried here lost their lives during the Meuse-Argonne Offensive of World War I. The immense array of headstones rises in long regular rows upward beyond a wide central pool to the chapel that crowns the ridge. A beautiful bronze screen separates the chapel foyer from the interior, which is decorated with stained-glass windows portraying American unit insignia; behind the altar are flags of the principal Allied nations.